There’s no shortage of charcoal grill tips at a barbecue as there’s always a few people who put themselves forward to do the grilling, you know the type. There’s always at least one person who thinks they know best about how the food should be cooked. Perhaps that’s you? If so, be warned, because it can lead to arguments and disasters if you’re not careful. It may appear to be easy to grill properly, and in many ways it is, but it doesn’t take much for things to go disastrously wrong. Many people think that a charcoal grill is one of the best grills you can get, but there are some basic rules which should be adhered to in order to get good results. There are two main factors which will affect results being good or bad. They are simply, the way the grill is used and fire or heat control. The grill needs setting up correctly and if you don’t get the fire right, then there’s little chance of getting good food. In simple terms, you need to concentrate and take things slowly. If you asked an expert if charcoal grilling is bad for you, the answer you’d get, probably wouldn’t be a straight yes or no. A study in 2012 did concluded there may be a link between eating smoked meat and breast cancer, but it didn’t single out charcoal grilling. According to the American Institute for Cancer Research, it can be unhealthy, but it depends on what you’re grilling and how it’s done. They say muscle proteins in any meat that are cooked at a high heat will form heterocyclic amines (HCA’s). These are carcinogenic compounds and it’s thought HCA’s might damage the DNA of our genes, which can start cancer development. If you wait until the charcoal is burned down and keep the grilling area as far from the heat as possible, the risks are reduced. 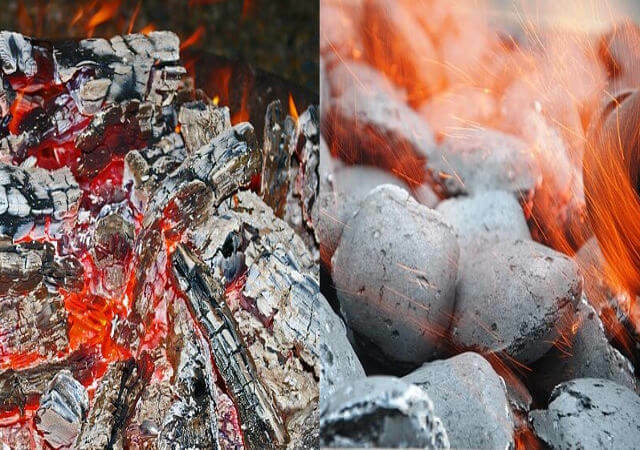 Lump charcoal and briquettes differ in their makeup. Lumps are made from burning wood without oxygen, the charcoal is what’s left behind. It will light easier and burn hotter. Briquettes are made from wood by-products mixed with additives to help them burn longer with a consistent temperature. While lumps are natural, they tend to be more expensive and burn more quickly. Briquettes are anything but natural, but are usually cheaper and the fact they burn longer, makes them more popular. Briquettes sell more, but lump charcoal sales are increasing amongst those who are looking for natural products. Both types of charcoal are essentially a product from the same materials. There’s no evidence that the additives in briquette charcoal are dangerous, especially if you let them burn off before starting to cook. If you want to add your own flavor to your food, just add a few chips or sawdust such as hickory wood on top of the charcoal. Grilling food takes longer than you might think, so you need to be patient and give it time to cook properly. We’ve all been there when the person in charge of the cooking keeps getting others coming over to see how it’s going and giving their “advice” as well. More often than not, this is because they are getting hungry and want to see if they can offer advice to speed things up, but what they’re actually doing is causing some annoyance. The best way to avoid this happening is to start out with a plan. Work out roughly when the food will be cooked and very importantly, start the fire at least 20 minutes earlier than planned, then at least it will be ready for cooking on time. It’s a common mistake to not light the fire early, then you have to wait until it’s ready and the cooking gets delayed. You might want to have a little something to eat before you start grilling, make sure the guests do too. This should help to stop them bothering you and will help your concentration. Don’t cook meat straight from the fridge or cool bag. Take it out and let it stand for at least 30 minutes before you begin to grill it as this will help it to cook perfectly. The amount of charcoal to use often gets overlooked. It obviously depends on the size of the grill you’re using. If you have a small charcoal grill it’ll need less than a larger one. The more you use, the hotter the fire will be and different meats need a varying heat. It’s a common belief that the more food you’re cooking, the more charcoal you need. That isn’t the case at all. Whatever the size of your grill, as a rough guide, it should be about two thirds covered. An average sized grill will need around 90 to 100 briquettes. Some people prefer to use a charcoal chimney starter which is a quick and efficient way get the coals burning – usually 10 to 15 minutes. Because it heats in a confined space, the charcoal gets extremely hot (up to 500f) very quickly. The briquettes can then be tipped onto the grill and left until they’re at the correct temperature for cooking. Now most people think they know how to light a charcoal grill, but they get it totally wrong. A few squirts of lighter fuel will work but it isn’t recommended because it may add a chemical flavor to your food. If you do use it, make sure you leave enough time for the fuel and chemicals to completely burn off. Keep the charcoal piled up in a heap, not spread out and cover all of it with the lighter fuel. This ensures each of the briquettes catch alight making the fire burn evenly. Once the fuel and chemicals have burnt off, the charcoal can be spread out. A better way to light the charcoal is by using a charcoal chimney starter, as previously mentioned. Because the briquettes are close together in a confined space, they will heat and catch light more quickly. 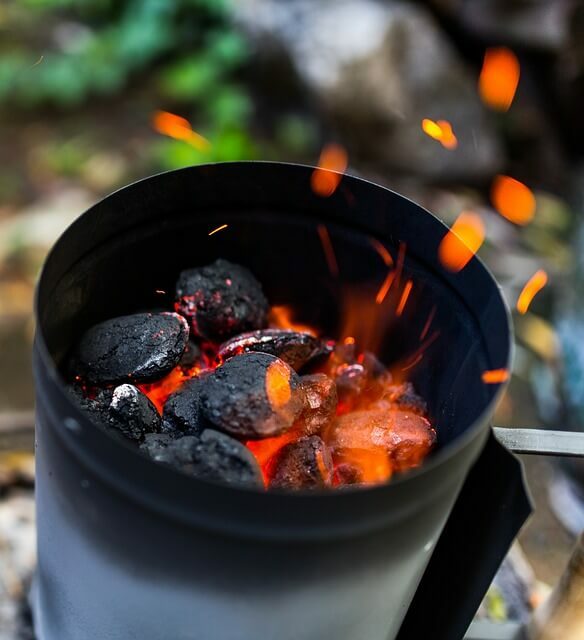 There’s no need to use lighter fuel or firelighters, an electric charcoal starter will do the job very well without leaving an aftertaste of chemicals. It can be used to ignite charcoal on the grill, but it’s better with a chimney starter. It’s important to know when the charcoal is ready to cook on because if you don’t wait until it’s burned down, it might be too hot and not cook evenly. It can also be unhealthy, as mentioned earlier. If you’re using a chimney starter, after around 10 minutes the briquettes will glow through the vents. After this, the flames will start to cover the top layer. Wait until they turn to a gray color and are covered in ash, which should be after about 15 minutes. When you tip them onto the grill, spread them out evenly. Lighting charcoal with fuel or an electric starter will take about the same amount of time. The briquettes should be piled into a heap for lighting and should be left until the flames die down. When the edges begin to turn gray, the briquettes can be spread out ready to use. Don’t be in a rush once the charcoal turns gray or white because even though the outside is hot, it takes longer for the middle to heat up. Wait until at least ⅔ of each briquette or lump has turned and the smoke has died right down. How Long Does Charcoal Stay Hot? If you’re planning to grill for a lot of guests, you’ll want to make sure the charcoal will stay hot long enough to complete the cooking. So how long do charcoals last? Well it depends on how you’re using it. Different types of grills will make a big difference to how long the charcoal stays hot. If you have a regular open grill, it should burn for about 45 minutes. You should get around 3 to 4 hours with a closed grill. The reason for the difference is that charcoal burns more quickly when exposed to oxygen, so if the air getting to it is regulated, it’ll burn longer. 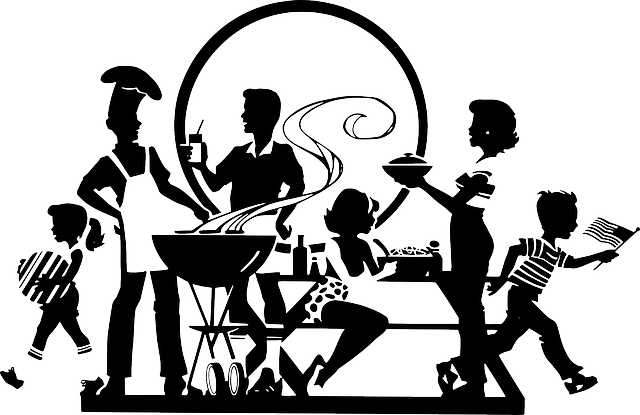 If you are using an open grill, remember that any wind may fan the flames and lessen the charcoal burn time. The air temperature can also make a difference, if it’s a cold day you may find the coals cool down quicker than on a hotter day. So, you can see there isn’t a straightforward answer to how long does charcoal last, but with practice you’ll get a feel for it. In most cases the charcoal should burn long enough to complete your grilling, but if you find you need to add more, don’t just throw it onto the fire. Preparing an extra amount in a chimney fire starter is best because once it’s ready it can easily be added. On the other hand, if you’re adding the charcoal directly to the fire, don’t add too much. Stop cooking until it’s burned down with less smoke and ⅔ of it has turned gray. Charcoal will stay hot for quite some time after you’ve finished cooking. The tempting thing to do is to pour water over it, but you shouldn’t do that at all. It will cause a lot of steam which could result in you getting burned. You could use a pair of tongs and place each piece of charcoal individually into a bucket of water. This will keep steam to a minimum, making it a safer option. The problem with doing this is that it’s very messy with a mix of dirty water and charred charcoal left in the bucket. It’s probably best to leave the grill to burn out and cool down naturally. Vents, if there are any, should be closed and if there’s a lid, cover the charcoal. Although it will stay hot for some time, by cutting off the oxygen the fire will go out more quickly. Burning charcoal gives off carbon monoxide so keep the grill outside until the fire is completely out. When you’re choosing a charcoal grill, you probably already have something in mind. You’ll know roughly the size and the features you’re looking for. Brand names will probably come into it too as there are just a handful of popular manufacturers. It’s difficult to define which is the best charcoal grill because it really does depend on exactly what you’re looking for. One of the most popular manufacturers is Weber which was formed in the 1950’s and they invented the Original Kettle Grill that has now been adapted by other companies too. Char Broil have been around since the late 1940’s and say they were one of the first companies to make charcoal grills. This was at a time when cooking outside and certainly barbecuing, were unheard of. The Char Broil Kettleman is similar to the Weber Original Kettle Premium in some ways. Both have around the same dimensions and there’s very little difference with the cooking area sizes. The Kettleman has 360 sq. inches (22½”) while the Weber has 363 sq. inches (22”). 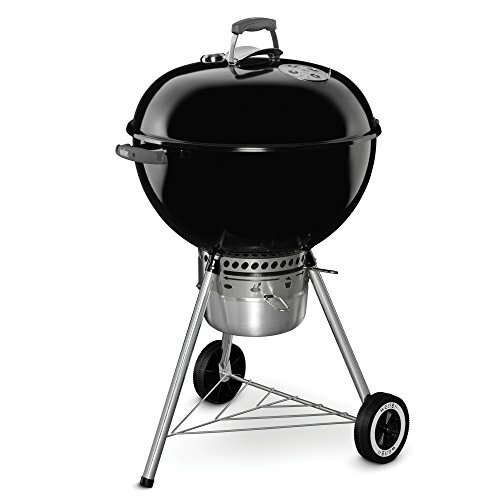 The Weber comes in a range of sizes from 18” to 37”, but the 22” is popular. These grills are very well built with safety being an important feature. The Kettleman’s TRU-Infrared technology is interesting because it’s said to improve the heat distribution. It’s more or less a sheet that radiates the heat and it has raised grates so there isn’t really any direct exposure to the hot charcoal. This prevents flare ups or hot spots. This technology does work well but the Weber does a great job of heat distribution, plus it also has a very simple, yet effective one touch ash collection system. If you don’t like cleaning up the ash when you’re finished, you might want to consider this. Plated steel and porcelain enamel feature in both grills together with a hinged lid and stable legs. The Kettleman has a wide leg base for extra stability and the Weber’s have been improved with spring loaded pins. There’s a temperature gauge fitted to each of them to help you keep the heat regulated together with air vents for further control. It’s difficult to choose one over the other, but the Weber is probably still the front runner, although the Char Broil puts up an extremely good fight. 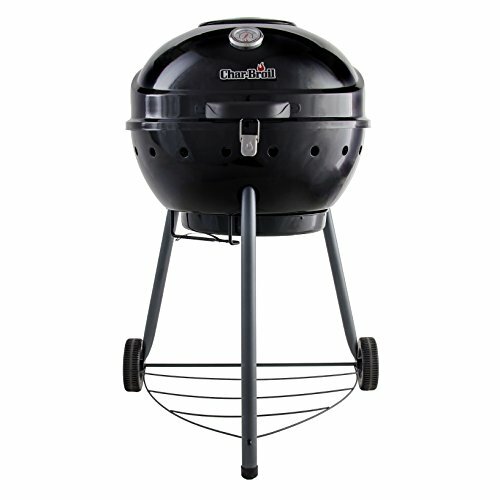 You can find out more about the Weber Original Kettle Premium and the Char Broil Kettleman at Amazon.com. Be careful if you’re checking out large charcoal grills because the overall size doesn’t necessarily mean it will have a larger cooking area than a small charcoal grill. The larger models are often designed with better features than smaller ones and add-ons to make them into luxury items. 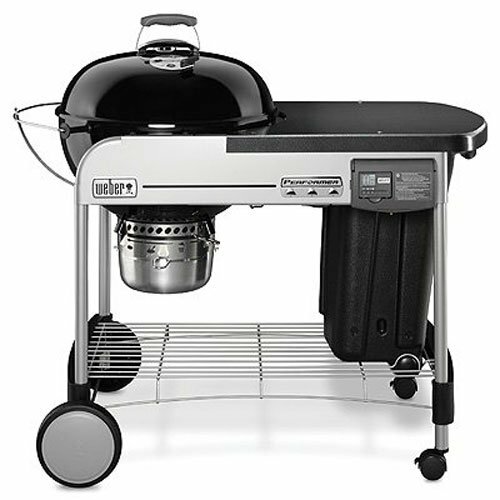 If we take Weber grills for example, the Performer Deluxe model is outstanding in many way, it has a very classy look about it, but the cooking area is 22 inches or 363 sq. inches. This is the same size as the most popular of the Original Kettle Premium range. Having said that, it has the excellent features of the Kettle but with more of them. There’s a steel cart frame with a table area which is not only convenient for the person cooking, but also helps to make it very stable. It’s Touch-n-Go gas ignition system makes lighting charcoal an easy task. Yes, you need to buy gas but, it’s only for lighting the fire, not for cooking. This makes things much easier. 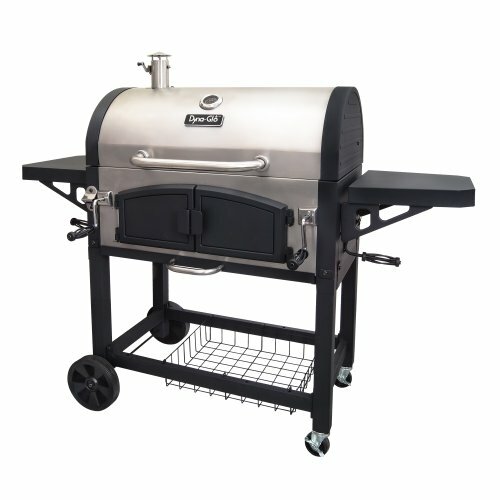 It’s offers great heat and smoke control because it has two charcoal baskets. They can be moved to the center or the edge for direct concentrated cooking or indirect cooking. The Weber Performer Deluxe is as deluxe as you would expect, but if you want a portable charcoal grill that can handle a lot of food, you might want to consider a Dyna Glo. Both the Dyna Glo DGN576DNC-D Premium and the Dual Zone DGN576SNC-D Premium have 816 sq. inches of cooking area, which is big enough to handle up to 30 hamburgers. The main difference between these two Dyna Glo’s is the Dual Zone of the SNC model which is a firebox that has a removable divider so it can be two separate areas if you wish. It has two adjustable charcoal baskets which can be independently raised or lowered so you can do different types of cooking on each side of the grill at the same time. Dimensions of the DNC and SNC are the same and they’re both easily portable and very stable. 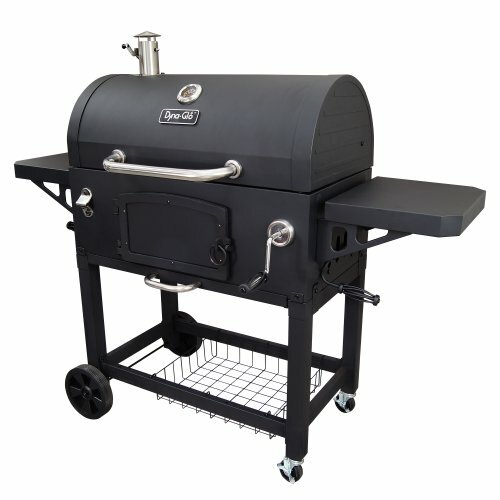 Both these Dyna Glo charcoal grills are very well made and designed for larger parties. The Weber Performer Deluxe might not handle as much food as the other two, but it does benefit by having the brand name of a much-respected company in the grilling world. Find out more about the Weber Performer Deluxe, the Dyna Glo DGN576DNC-D Premium and Dual Zone DGN576SNC-D Premium at Amazon.com. Once the charcoal is ready to cook when it has a hot glow rather than any flames, make sure there’s enough to last for the whole cook. As mentioned earlier, you don’t really want to be adding more half way through as this will alter the quality of the fire. If you need to, you can increase the heat by blowing or fanning the fire a little bit. To reduce the temperature, add a little water to the outside of the fire to dampen it, but be sure to not use too much. You can always test that the temperature is right if you don’t have a thermometer by testing with a small piece of meat. It’s best to remove as much fat from the meat as possible before cooking. This obviously has a health benefit, but it also stops the fat dripping into the fire which can cause flare ups and ruin the end result. This won’t be such a problem if you have a grill such as the Char Broil Kettleman because of its Tru-Infrared system which distributes the heat evenly and is designed so no food and less fat fall into the fire. Probably the most important thing is to make sure the meat is thoroughly cooked all the way through. It’s so easy to think it’s done just because the outside looks that way. This is particularly the case with thicker cuts of meat, especially chicken which often carry harmful bacteria and is only destroyed if it’s cooked properly. Undercooked chicken is a common cause of food poisoning, so be sure it’s thoroughly done. One way to make sure the meat gets cooked properly is to start with it placed close to the center of the grill, where it’s hottest, to sear it. Then when that’s done, move to the outside where it’s not quite so intense and it can then cook all the way through. Of course everyone has their own ideas about the best way to grill and to some degree there is no right or wrong way as long as the basic principles are stuck to. These charcoal grill tips should, hopefully give you an idea about doing it correctly, but do remember to put your own stamp on to it as well. Copyright © 2019 by Charcoal Grill World.